Professor Ménard was born in Québec city, QC, Canada. He received the B.Eng. and PhD degree in electrical engineering from McGill University, Montreal, QC, Canada, in 2002 and 2009, respectively. At McGill, he worked on the design and implementation of novel devices for optical telecommunication applications, including spatial formatting in dense wavelength division multiplexer and broadband high-density electro-optical space switches in III-V waveguides. From 2009 to 2011, he was a post-doctoral fellow with the Cornell Nanophotonics Group under the supervision of Prof. Michal Lipson. At Cornell, he investigated broadband wavelength conversion with silicon waveguides for fiber and free space telecommunication in collaboration with Prof. Alexander Gaeta, also from Cornell, and Prof. Keren Bergman from Columbia University. The free space telecommunication work involved wavelength conversion between the near and the mid-infrared and was part of DARPA CIPhER program. 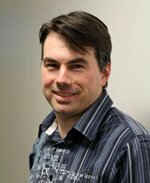 In June 2011, Prof. Ménard joined the microelectronic program at UQAM as an assistant professor. He is an active member in two institutional centers: the center for Co-design and Fabrication of Microsystems (CoFaMic) and NanoQAM, the research center on nanomaterials and energy. At the provincial level, he is involved in the Center for Optics, Photonics and Lasers (COPL) and the Microsystems Strategic Alliance of Québec (ReSMiQ).